"Khamoshi The Musical" is a 1996 hindi film which has Nana Patekar, Salman Khan, Manisha Koirala, Seema Biswas, Helen, Himani Shivpuri and Raghuveer Yadav in lead roles. 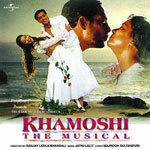 We have 6 songs lyrics and 6 video songs of Khamoshi The Musical. Jatin, Lalit and Remo Fernandes have composed its music. Kavita Krishnamurthy, Shraddha Pandit, Hariharan, Alka Yagnik, Kumar Sanu, Remo Fernandes and Dominique Cerejo have sung these songs while Majrooh Sultanpuri has penned its lyrics.